The perfect wedding day look is an amalgamation that leaves you feeling radiant and special—and also distinctly you. But how do you strike that balance when donning a once-in-a-lifetime white dress...something that’s decidedly not normal? Put your finishing touch to work. Accessories are a bride’s best style ally, after all. Dress your overall look up or down, inject a pop of color or dimension, infuse meaningful nods to past or future. Put simply: Opt for pieces that speak to you. Dreamy hues and light-catching materials create an ethereal air with a modern edge. Sarah’s Vintage & Estate Jewelry: Cascading fantasy cut Citrine quartz earrings, circa 1990, $785; Japanese akoya pearl & diamond ring, circa 1950, $395; Mother-of-pearl inlay compact/cigarette case, dated 1956, $68. 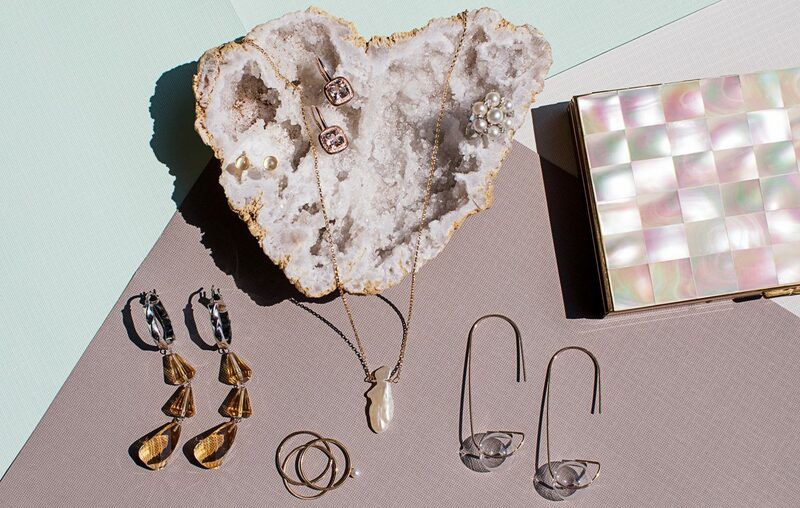 Pretty + Grit: Balance moonstone studs, $32; Basic baby pearl stacker ring, $22; Balance double stacker ring, $32. Ben Garelick: Cushion halo morganite & diamond dangle earrings, $1200. Pegs Hardware: Keshi pearl necklace, $48; G’s Orbe earrings, $46. Classic glitz and clean lines merge for a final result that’s pared down without losing its dramatic flair. Ben Garelick: Twist diamond hoop earrings, $1875; Multi-strand tinsel necklace, $250; Blue sapphire & diamond “Lusso“ pave ring, $1825. Pegs Hardware: Arch pearl matchstick earrings, $42; Two-tone three dot threaders, $42. Natural elements take on new interpretations in an ode to the beauty that surrounds. Pretty + Grit: I don’t quartz AA druzy necklace, $48, and ring, $42; Basic freshwater pearl & bar lariat necklace, $90. Pegs Hardware: Matchstick half hoop amethyst earrings, $44; Brass and tortoise “Tilly” earrings, $46; Herkimer diamond threaders, $46. Ben Garelick: Diamond pave “Star” pendant, $750. Before you put them on each other’s fingers, walk your wedding bands down the aisle in a holder that’s worthy of a moment in the spotlight—and a place in your house for years to come.